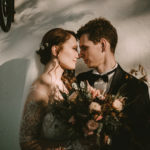 Aris was interested in what we want, as opposed to hotels and UK wedding agencies we talked to before, who rather offer standard non-customizable packages. We decided to trust Aris and explained how we see our big day (with colour scheme and inspirational photos). At last we were in Corfu again in October with all our guests! Suddenly we started to realize that the weather could be bad on the day of our outdoor wedding. We meet Aris on Saturday morning to catch up and discuss our wedding plan for Monday. I’ve asked out of worry if we can move our ceremony one day earlier (meaning tomorrow) because all our guests were here already and to my surprise Aris was very positive and enthusiastic about it! We really really appreciate how fast he was to sort everything out. We were literally sitting at the coffee place for hour and a half and discussing how to make it possible and watching Aris making millions of calls to make sure everything will be ok. From the next morning everything went very smoothly. The wedding team was very organized and very professional. I didn’t feel like I need to care about anything at all. Everything was at the right time, there was no issues that required our involvement and everyone including our guests knew what they were doing. As for decoration and organizations we always knew Aris will do a good job, but he did exceed our expectations. Everything looked perfect and I could not believe that it was possible for our wedding to look so beautiful. 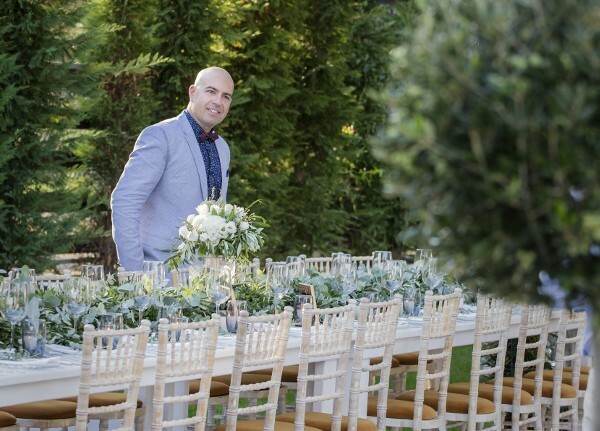 Aris and his florist complimented the natural scenery to suit our wedding theme perfectly. It was a magical feeling. The reception place looked stunning, I unintentionally stopped to get my head around and appreciate the decoration. Everything was smooth, everything looked beyond gorgeous and thus made two days to feel even more special and happy for us. It means a lot for us how exited and positive Aris always was, always ready to go extra mile and perform amazing results.